110 x 80 mm and weighs only 200 g Therefore, the leather moisture meter like in the leather industry for the first material evaluation. If you have further questions about the leather moisture meter PCE-SKR 6, look at the following technical information, read the technical data or get in contact with us: UK customers +44(0) 23 809 870 30 / US customers +1-410-387-7703. 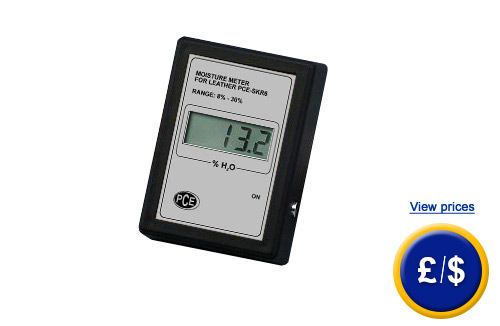 Our technicians and engineers will inform you about our leather moisture meter or any other product of in the field of Regulation and Control, Measuring Instruments or Scales and Balances of PCE Instruments Ltd.
- Measuring range: 8 ... 30 % r.H.